You are here: Home | Exhibitor search | WISCHT d.o.o. Wischt d.o.o. company founded in 1996. is a specialized manufacturer of high quality vacuum membrane presses used in medium and industrial processes. Rotational presses with more working tables for saving the time of production. We also produce machines on customer request so almost all changes are possible respect the standard models, in order to improve productivity of production. Our clients are our priority. INNOVATION - WISCHT company invented one of the first rotational vacuum membrane press in the world. As the most productive vacuum membrane press entered in the Register of Patents in European Patent Office under No. EP 2 207667 B1 in 2010th and a US Patent under No 8 109310 B2, in 2012th. We have rotational presses with 2, 4 or 6 working tables which allows tremendous energy and space saving, fully continuous operation and far greater capacity than similar competitive presses. During our years of experience we have sold many machines all over the world from North and South America, Africa, Asia to all over the Europe, intended for WOODWORKING INDUSTRY, ARCHITECTURE AND INTERIORS, GRAPHIC INDUSTRY, CAR AND AIRCRAFT INDUSTRY etc. Primarily due to our innovation and internationally recognized patents, which are confirmed by numerous awards, we grew up together with our partners achieving professionalism, competence and experience. Quality control, innovation, customer care and competitive spirit make Wischt company the ideal partner for all companies regardless their dimensions, starting from the family ones up to the industrial groups. We are a team that had its innovation into a finished product, and the product is made available to you. The WISCHT VACUUM MEMBRANE PRESS RVPM2 is a robust 2 table rotational vacuum membrane press, with powerful heating system up to 80 degrees placed in the bottom of the machine. This vacuum membrane press is intended for medium and industrial production 2D and 3D coating, bending , veneering and laminating curves and flat surfaces with the desired wood materials. RVPM2 model produced since 2007th , is our BEST SELLING machine. This model allows the preparation of a second load during the gluing time of the first load, which provides time, energy and space savings, fully continuous operation and great capacity. The new generation of this model is upgraded with a special frames and powerful heating system from the top of the machine ( the moving hot chamber up to 120 degrees), which allows also PVC Foil-Lamination. WISCHT vacuum presses are known in the world as the most productive presses, thanks to the patented solutions made especially for rotational models of vacuum presses. INNOVATION - WISCHT company invented one of the first rotational vacuum membrane press in the world. As the most productive vacuum membrane press entered in the Register of Patents in European Patent Office under No. EP 2 207667 B1 in 2010th and a US Patent under No 8 109310 B2, in 2012th. We have produced rotational presses with 2, 4 or 6 working tables. WISCHT RVPM 6 model is a unique rotational vacuum membrane press with 6 working tables, intended for medium and industrial production . This machine allows tremendous energy, time and space savings, fully continuous operation and far greater capacity than any similar competitive press in the world. Capacity increase up to 6 times respect a standard one table vacuum press. This model is cold vacuum membrane press, with possible upgrade with powerful heating system. RVPM6 vacuum membrane press provides endless possibilities in production, it is intended for laminating, veneering and coating of furniture, interiors etc. It can be also used for forming and shaping of thermoplastic materials (in combination with hot oven) , or overlaying and bonding of flat and curved materials. 5 machines combined in one unit, it's the main innovation of OPTIMUS 55. OPTIMUS 55 is an extraordinary vacuum membrane press, which can be used in multiple functions at once. This is a modular machine carefully designed in base of customers production needs, so every client can decide which and how many operations wants to have in the machine, in order to improve productivity of production. It is an innovation in vacuum presses market because it fully integrates all the necessary operations from different sectors of production as for example : Wood industry, Car and Aircraft industry, Graphic industry, Architecture and Interior design and many more. Therefore it allows energy and space saving, but in the same time it’s also an economical solution for multi functional productions. The WPE-Subli VACUUM MEMBRANE PRESS intended for high quality SUBLIMATION process is a combined machine of a double sided or one sided preheating, with aluminum heating plates from the bottom and hot air circulation oven from the top side and a vacuum membrane press in one chassis. This process consists of transferring images into the Solid Surface or another material prepared for SUBLIMATION. With this machine you can also produce 3D sublimation products giving an excellent simultaneous sublimation print on the main face and side of the material. WPE-Subli vacuum membrane press provides you endless possibilities producing personalized interior or exterior designed pieces in Wood, Stone, Ceramics, Glass, Acrylic, Aluminum, HPL, Textile, Solid surfaces etc. WPE-Subli vacuum membrane press for high quality sublimation process on large dimensions, is an perfect solution for personalized design productions in GRAPHIC INDUSTRY, WOOD INDUSTRY, ARCHITECTURE, INTERIOR DESIGN, CAR AND AIRCRAFT INDUSTRY etc. veneering, laminating, forming, and profile wrapping. VPM WISCHT vacuum membrane press provides you endless possibilities in production. 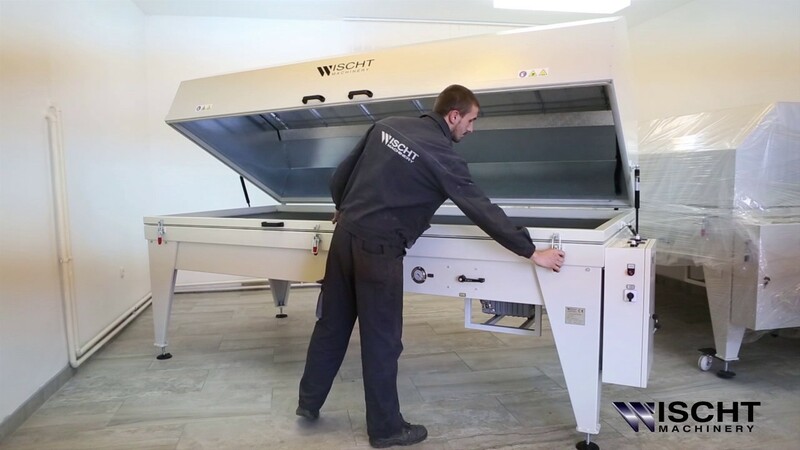 This vacuum membrane press is a great solution for producing laminated, veneered and coated furniture or other unique pieces of interiors as well as for overlaying and bonding of flat and curved materials. It is intended primarily for carpentry workshops and furniture productions as well as for other type of production where it’s not necessary to achieve operating temperatures of more than 80 degrees. VPM-1330-H100 with temperature up to 120 degrees and special frame for the foils. The vacuum membrane press of series VPM H100 is almost the same model as VPM H80 which can be used perfectly for same working requires, but upgraded with the special frame for the foil and with the stronger heating system, which provides also high quality PVC Foil laminating processes.